Still searching for that perfect Christmas gift? I say Christmas and not HannuChrisKwanzadan because I'm pretty sure you'll only want to get this little gem for your Christian friends and family. The makers of the popular video series "Left Behind" (which stars none other than Kirk Cameron who played our favorite hooligan with a heart of gold, Mike Seaver on 'Growing Pains' prior to his intense religious conversion), have released a new video game. 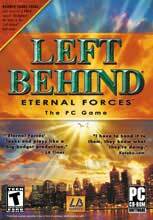 Titled "Left Behind: Eternal Forces" (rated 'T' for Teen) the game's objective is to kill or convert as many "opposition forces" (to be read 'non-Christians') as possible before the second coming. If you need a copy before the 25th, Wal-mart carries it. Now, I've gone to the "Left Behind" website and they say I shouldn't bash the game until I have seen it personally. And they are right, I shouldn't. But as it turns out, I don't know anybody who owns a copy, so I'm just going to have to go with what I read on the internet. Besides, I'm not really sure that seeing the game would change what I'm thinking about it (that it is terrible). I'm fairly certain I won't say "Wow! Great graphics! They really make me want to ignore the blatant religious intolerance". My guess would be that if you're looking for violence in the name of religion (you can pretty much take your pick of which one) save your $39.82 and turn on the news. If you are looking for violence for entertainment’s sake, can I recommend "Grand Theft Auto: San Andreas"? I got a free copy of the book one time. But, I never read it. I guess that doesn't contribute a single thing to the conversation. And, it's also not a conversation if I'm the only one who responds. Don't give up gris gris. People will comment. Eventually. Maybe a New Favorite Animal?